The Shala (school) is the vision of founder and CEO Kavita Khosa. It has been established as a platform to promote, propagate and cultivate the ancient arts, sciences and philosophies of the East. 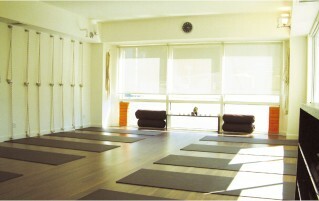 An airy and sunlit studio located in Lan Kwai Fong in the very heart of Central, Sachananda Yoga Shala has been designed to create an environment which evokes a sense of peace and serenity. The Shala vibrates with a quiet, subtle energy, drawing the student into a state of relaxed alertness which is essential for the practice of Yoga. The Shala has a modest library, changing room, locker facilities and has been custom built with quality props and equipment such as mats, wall ropes, blocks, belts and backbend extensions for the practice of Iyengar Yoga. yoga and ayurveda products at the shala. The shala is disinfected everyday, however, in the interests of hygiene and as a courtesy to the next student, please wipe down your mat after class with the disinfectant wipes provided. You can find pre-class advice here.